In 1546 Lucas Cranach the Elder painted The Fountain of Youth. His painting depicted old, hunched over, wrinkly-skinned adults walking unsteadily out of horse-drawn coaches, disrobing and stepping into a pool of water to come out of the pool on the other side as virile, flexible, sharp-eyed, smooth-skinned young people once again. Today there is a compendium of science-backed studies that comprise a modern fountain of youth that is slowly being pieced together. But unexpectedly the public is not putting this age-reversing science into practice. This lag in putting anti-aging science into practice may emanate from a number of factors. First, the prevalent mind-set to think about treatment for each and every disease of aging as they materialize– failing vision, stiff joints, heart failure — rather than address aging itself. Patients think this way now: a drug for every disease. And most adults would be fearful of abandoning their prescription drugs for these new anti-aging elixirs even though drugs they take induce side effects and nutrient deficiencies that require even more drugs to allay. Second, maybe the public is waiting for doctors to order and insurance to pay for anti-aging elixirs. Doctors are financially rewarded when they diagnose, prescribe and treat diseases, not when they prevent them. Doctors have largely become insurance billing code practitioners. If insurance doesn’t pay it’s not likely to get prescribed. And frankly, most of the regenerative measures I am writing about here are non-prescription and won’t bring patients back to the doctor’s office. When patients hear of these breakthroughs in the news media they frequently run them past their doctors who summarily dismiss them as unproven (but not disproven) while they prescribe drugs that have a low rate of effectiveness and are fraught with side effects. For example, statin cholesterol-lowering drugs must be prescribed to 200 healthy adults to prevent just one non-mortal heart attack over a period of 5 years while markedly increasing the risk for diabetes, cataracts, memory loss and painful joints. Third, then there is hesitancy by the public themselves. There are unstated fears over outliving their retirement funds or spending the last years of their lives drooling from the mouth in a demented state, or befuddling concerns that super-longevity will contribute to overpopulation. In the past few years biologists have begun to report on ways to reverse wrinkled skin, clear-up cloudy cataracts, slow down progressive shrinkage of the brain, slow muscle and bone loss, maintain flexible joints, naturally elevate estrogen and testosterone, even produce Viagra-like effects with herbal molecules. But even these remarkable feats fail to create a stir among the masses. The modern fountain of youth flows but few are stopping to bathe in it. Even though most of these anti-aging strategies have been well publicized in the news media as well as in scientific journals, it appears only a few adroit individuals are putting these breakthroughs into practice. 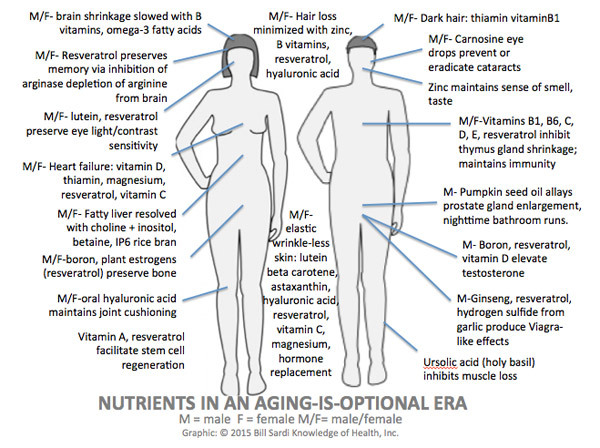 Most Americans simply can’t afford $50-100/month of nutraceuticals to stave off the effects of aging. One wonders if the financial meltdown of 2008 was in part a way to demolish individual wealth as a form of population control given these new anti-aging strategies would add healthy years to the end of life. Of the little discretionary income that remains, some retirees spend it on pet food, cigarettes, alcohol, bingo games and vacations and want Medicare to pay for all these new elixirs. Instead of employing natural medicines that address the aging process itself, problematic prescription drugs are forced on retirees because health plans pay for them. Medicare offers a plan (Part B) to pay for over-priced synthetic drugs, not economical non-Rx nutraceuticals. Here is a brief list of some science-backed age-reversing remedies, with clickable links to the published scientific reports that substantiate them. The most remarkable of all the anti-aging molecules is resveratrol because it works in so many ways to youthify the human body. ©2015 Bill Sardi, Knowledge of Health, Inc.